Happy Monday! 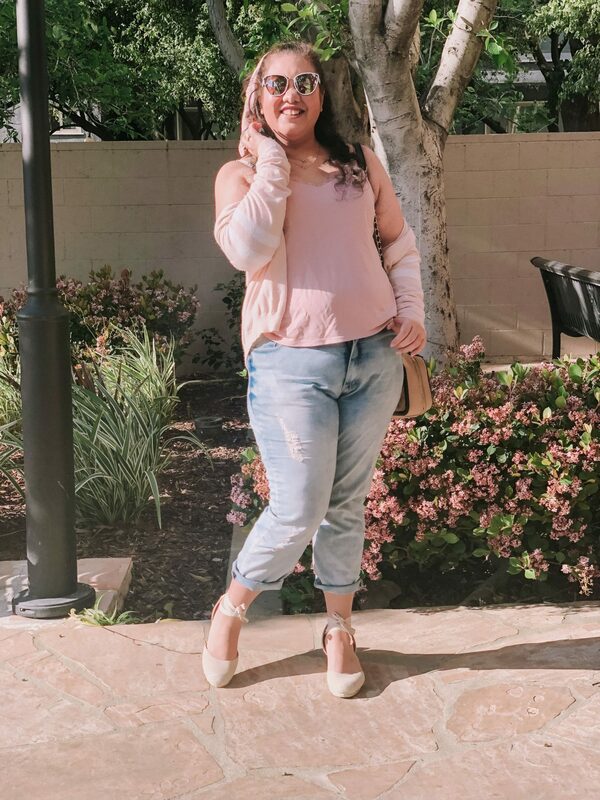 Today I’m sharing my go to everyday outfit and the cutest wedges for spring! It’s finally the perfect weather here in LA and I’m embracing all the spring trends. Also my dad just flew in last week so that means I have my photographer back again so expect more outfits as we’ve spent all weekend shooting. I finally got to wear my new espadrilles that I bought in February and this is the outfit I wore with them. 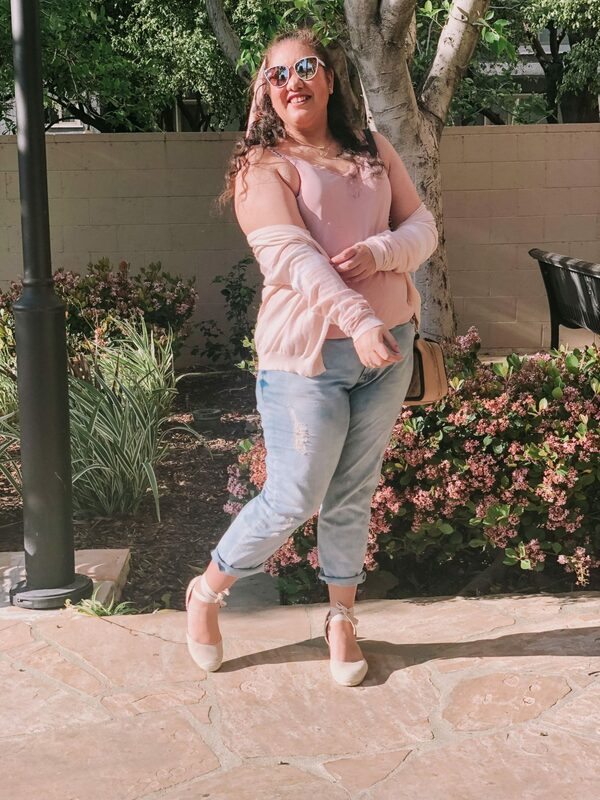 So here is the details to my favorite spring outfit and the cutest wedges for spring and my recommendations. To start off my outfit, I wore this pink cami with a peachy colored cardigan. 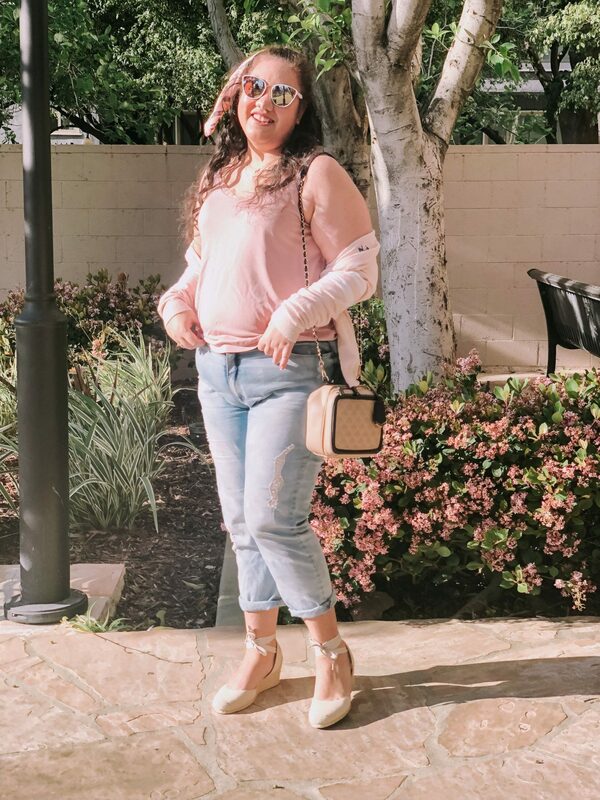 It’s such a cute spring top and it is great to layer with as well under sweaters during the cooler season. Then my jeans are the comfiest and so great for everyday. Now the main point of this blog post. I found the perfect spring shoes and I have been dying to wear them. The weather is finally warming up and I can wear them out. I searched high and low for the perfect espadrilles. I never owned a pair and I loved the look of them. I wanted ones with ties and not too high of a wedge so it’s easy to walk in. When I found these I bought them straight away. They come in wide width, was my size (which fit me pretty big so you may have to size down half a size) and has 2 inch wedge heel. The best part is they are under $50 so a total win. I was so excited to style them and I have more ideas so stay tuned as you will be seeing more of these in my outfits. I’ve listed the exact ones I have and a few more options from different styles and price points. I’m so in love with these espadrilles. I am totally on board with this trend and saw these are similar to a designer pair. I love the tie up detail and since I know how to tie pointe shoes it reminded me of that. It brought back memories and it’s a bit annoying if you are in a rush but if you take your time and tie it securely then they are quite comfy. Also it’s surprising that they are easy to walk in and quite comfortable on my feet. If they aren’t as big as they are I think I could walk in them all day. The accessories were quite cute with this outfit and love how they turned out. I embraced a few spring accessory trends as well especially the hair scarf. You know I love my bows but hair scarfs are similar to that so it felt just the same. I love the print of this and it was only $3 so quite a steal and so pretty. 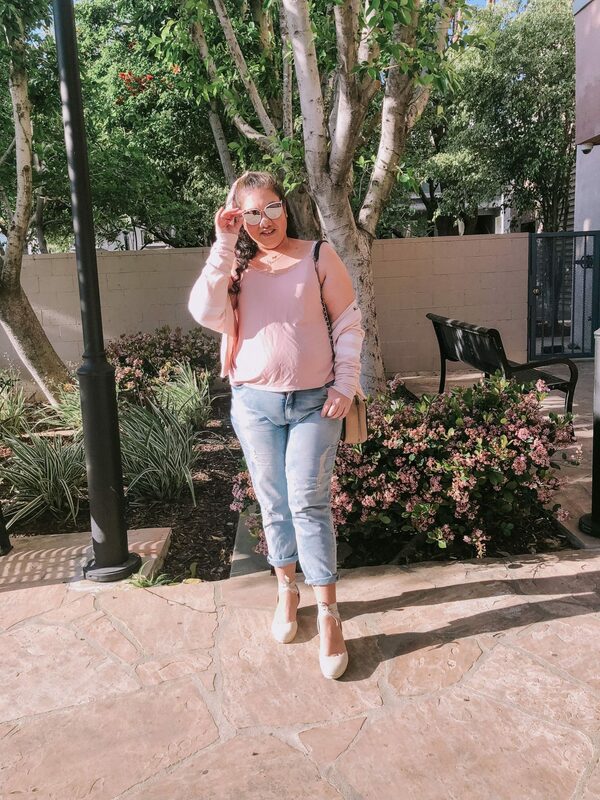 Then my sunglasses are new which I got from Lulu’s a few months ago as well and now that it’s sunny they are my go to accessory and the perfect color palette for spring and summer as they are white and rose gold plus they will match so many of my outfits. As for jewelry, I played around and layered a few of my bow pendents together and love how it turned out. I usually only wear one necklace but I tried a few together and it turned out so well. 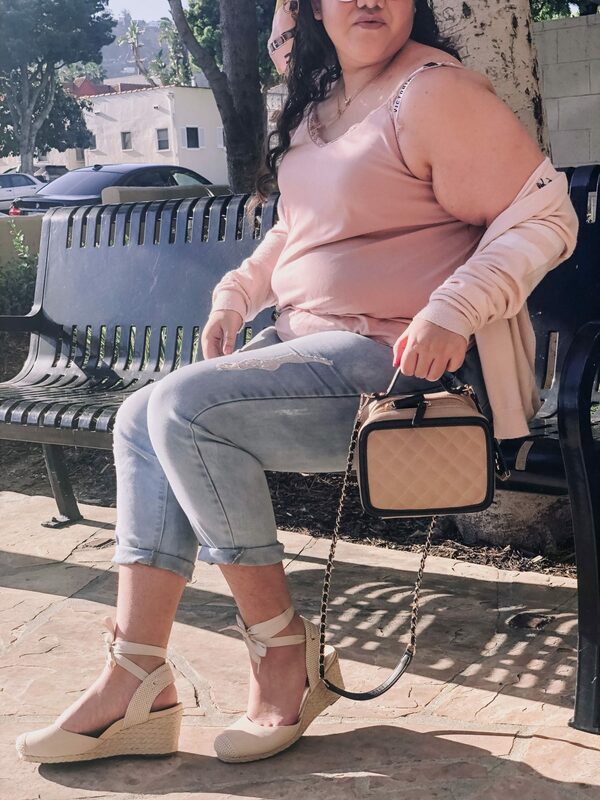 I’m also wearing all of my everyday pieces that are I just shared in this post here. 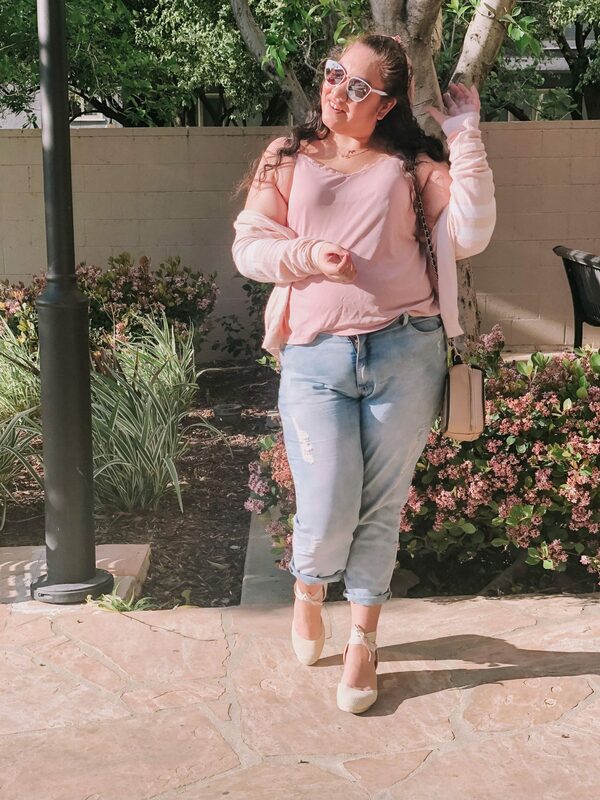 Those were the cutest wedges for spring and my current go to everyday outfit. I am not kidding that I have been living in this as it’s cute and comfy. Also it’s so nice to have my dad back to shoot my pictures. He actually did quite a good job for his first time again and using my camera. We took these by my apartment and had to shoot these wedges in front of this pink flower bush which matched my outfit perfectly. We had such a fun day together and I am showing him around and we are doing all the tourists things. I have been vlogging, planning outfit shoots and so that means so many fun things coming up for me. So stay tuned for that! 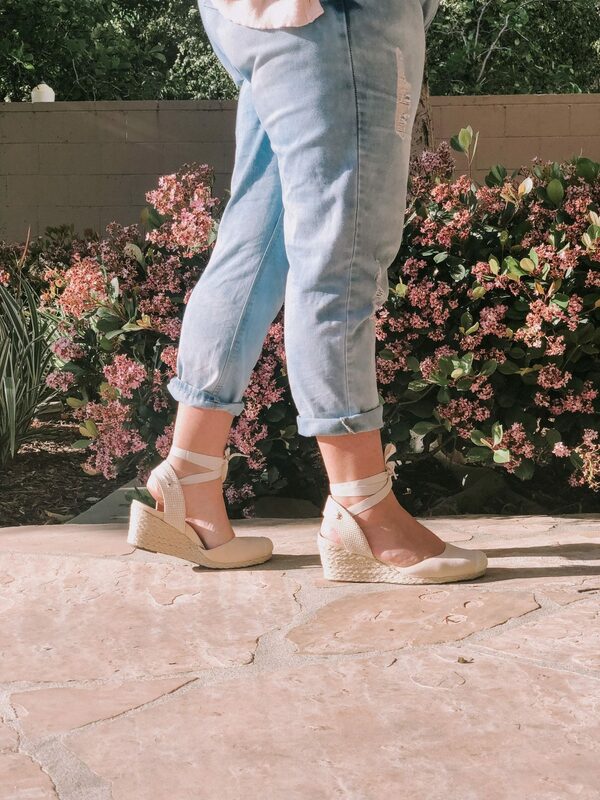 Those were the cutest wedges for spring and I love them so much. 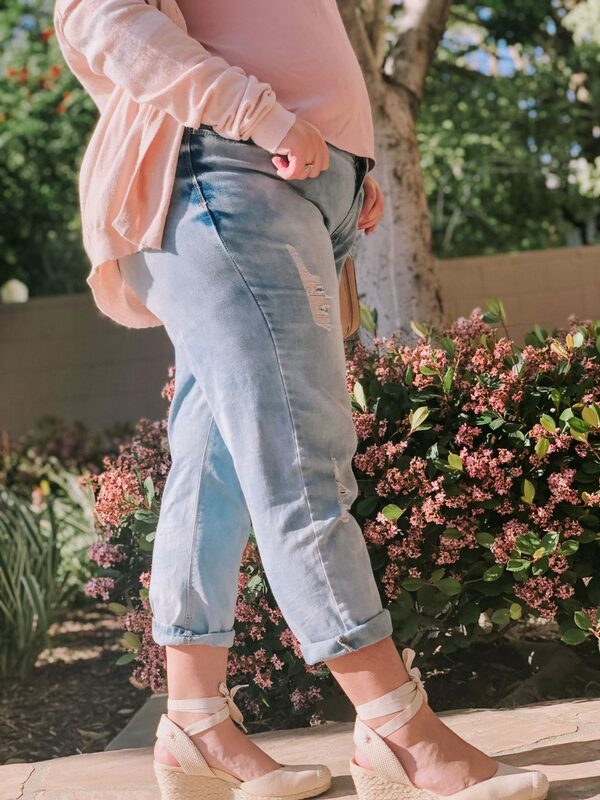 I’d love to know your favorite spring shoes right now! These espadrilles are the cutest! I love the string ties around the ankles! Those shoes are so cute! Perfect for Spring! Those are super duper cute! I love the neutral color and the ties. Those are super cute wedges! I was looking at black ones just like them.